What do the first Jesuit community college and an empire of Italian restaurants, stores, and cookbooks have in common? 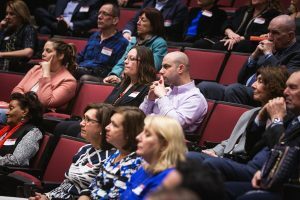 Quite a lot, it turns out, as attendees learned at an April 3 event at the Lincoln Center campus. 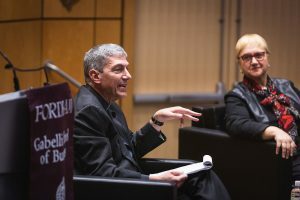 The evening chat hosted by the Gabelli School of Business brought together Lidia Bastianich, a co-founder of iconic Italian eateries such as Eataly and Del Posto, and Steve Katsouros, S.J., GSE ’87, dean and executive director of Arrupe College at Loyola University Chicago. In a wide-ranging chat, Q&A, reception and book signing, Bastianich and Katsouros discussed the challenges of getting a new idea off the ground, the best ways to scale up, and the current state of their respective industries. James Martin, S.J., asked Bastianich what lessons she could share, as a former refugee. Bastianich, whose television show Lidia’s Kitchen airs on PBS stations around the country and whose 16th book My American Dream (Knopf, 2018) details her life’s journey, weighed in on current proposals to raise restaurant workers’ minimum wage (she has mixed feelings) and how to stay relevant (She routinely takes her chefs to Italy to educate them). Asked how one can launch a business with limited resources, she said entrepreneurs have to be the best they can be, and invest all that they can to continually educate themselves. “When you make that product, when you cook, it’s got to be better. That’s what makes it successful. Coupled with that, you have to be enthusiastic. You need to love it. It requires commitment, it requires extra hours. And lastly, just pull up your sleeves and work. There’s a lot of work behind any successful story,” she said. Bastianich also spoke passionately about how grateful she is that the United States welcomed her family to its shores when they sought refuge here in 1958. 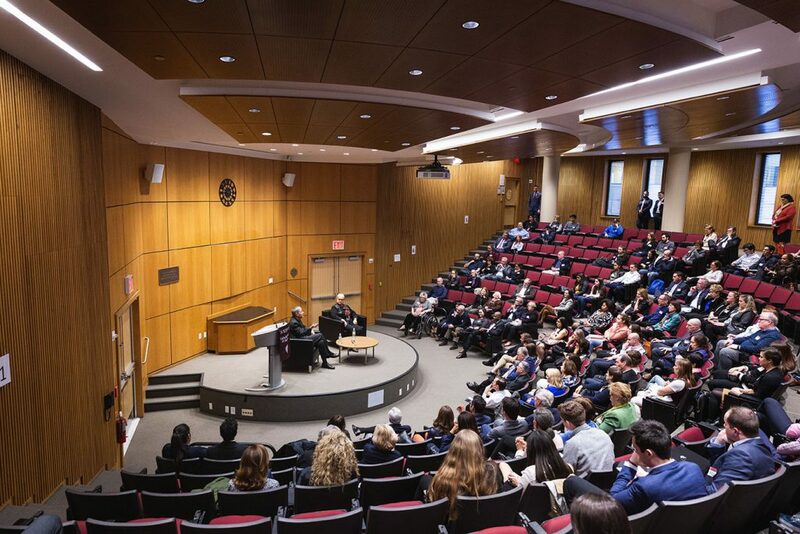 The event drew a mix of students, faculty, and Gabelli School of Business alumni. When Italy lost World War II, she said, the island of Istria, where she was born and raised, ceased to belong to Italy and became part of Communist Yugoslavia. When living there became untenable, her family fled to Italy and lived in a refugee camp for two years before the United States granted them entry. With the help of Catholic Relief Services, the family moved to New Jersey, and then Queens, where Bastianich started in the restaurant business. The restaurant industry is an ideal place to help others the way she was helped, she said. She takes great pride in the fact that former dishwashers in her restaurants—many of them immigrants who spoke no English at first—have worked their way up to becoming sous chefs. “Knowing what was not possible behind me when I left, and then having all these possibilities is what really drives me. It was not so much that I have an economic goal though. It was a goal of accomplishment. It was a goal to be who you are. To this day, if there’s an opportunity, I still want to get involved in it,” she said. “We’re very proud that our students graduate with no debt,” Katsouros said of Arrupe College. 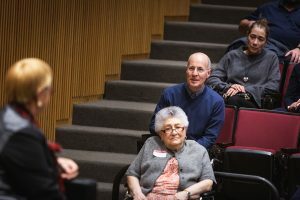 Katsouros said Arrupe, which graduated its first cohort of 159 students in 2015, and has sent 88 percent of its graduates to four-year colleges, is likewise geared toward those who need a little help. The school’s goal was to give a boost to high school students who lacked either the financial resources or grades to attend a four-year college while not saddling them with debt. 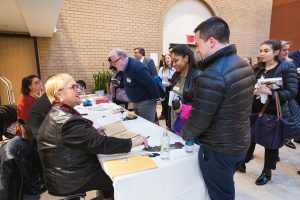 Seventy percent of Arrupe students are Latino and 50 percent are immigrants, so the college employs social workers and immigration attorneys to provide guidance to them. “These immigrants, these students—when they graduate, they’re going to competitive schools, they’re the heads of student government, they’re a third of the deans’ lists, they’re the highest grades at Arrupe,” he said. “So these are the people we need to create more opportunities for, just like you’ve been doing,” he said to Bastianich. The Society of Jesus is also a common thread through both of their lives. Katsouras noted that few of Arrupe’s students were familiar with the Jesuits before enrolling, but were especially drawn to the biography of founder St. Ignatius Loyola, particularly the radical change he underwent during his convalescence after his leg was shattered by a cannonball in 1517. “I’ll ask them, ‘What’s been a cannonball in your life that changed the direction of your life? That’s been very thought-provoking for them,” he said. Bastianich signed copies of her book at a reception afterward. Bastianich credited the Jesuits with helping her raise her children, who attended Jesuit high schools and Universities. Restaurants, she noted, are extremely demanding, and when she and her husband opened their first one when she was 22, she felt guilty that she couldn’t spend more time with her young children. “I felt that the Jesuit schooling actually helped me raise my children. They got the spiritual, moral lessons that I didn’t have the time to give them,” she said. What makes her happy more than anything, she said, is feeding others. “When we left and went to Italy, I did not know we would not return. I remember after a few months, I realized, ‘My god, I’m not going to go back; I’m not going to see grandma.’ And food became my recall mechanism. I would cook, and the aromas and tastes would remind me of then,” she said.